Red White Blue Blog Hop starts tomorrow! 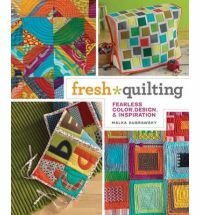 Looking for some quilt block inspiration? Yes! Well, you're in luck because July 1st kicks off 2 weeks of 100 bloggers sharing 10.5"or 12.5" blocks in Red/White/Blue. For the 2 week blog hop schedule, visit our blog hop hostess, Jane, so you won't miss a day of the fun! It's been raining here, on and off for days. Getting a little concerned that our basement will flood again. Have to say, it doesn't feel like summer at all. Seems crazy that I have to turn the lights on during the day or the house is like a cave. So to counter the gloominess, I've been working on something in colours that make me think of summer... they remind me of popsicles. I raided my stash and pulled a selection of pinks and oranges, cut some strips and played around with their arrangement. 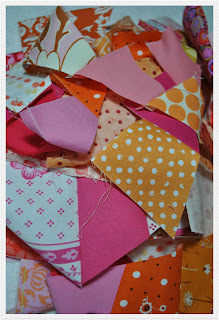 When all the sewing and cutting was complete, I found I was left with some lovely scraps. with a finish to follow soon. 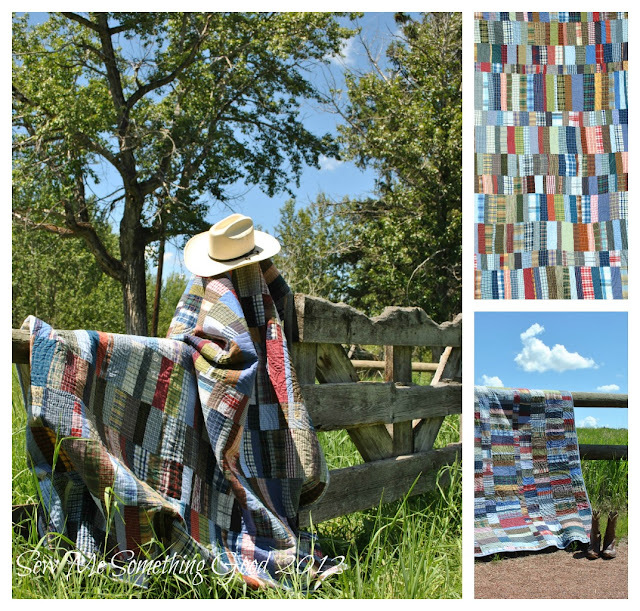 These fabrics are cheering up my dark day while I wait for summer weather to find us. A huge thank-you to everyone that stopped by to comment on the quilt I made as a pattern tester for Amanda Jean's Candy Coated quilt for her book with Cheryl, Sunday Morning Quilts. You made my day! 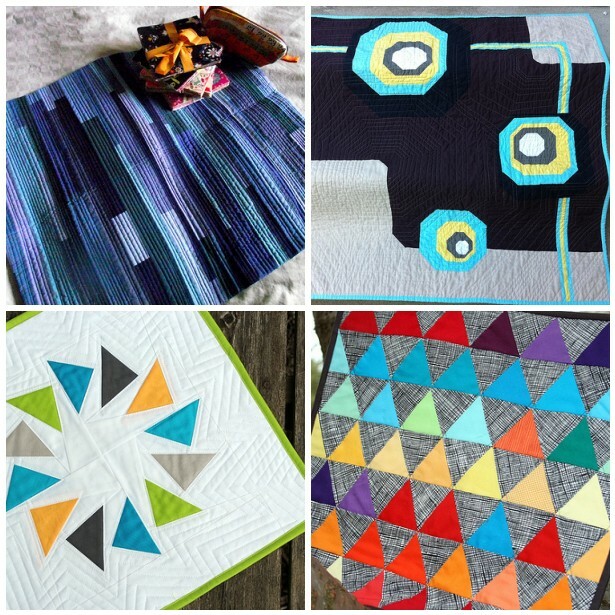 Special thanks to Amanda Jean for her post sharing the versions of all of her pattern testers. Wow. Talk about inspiring! 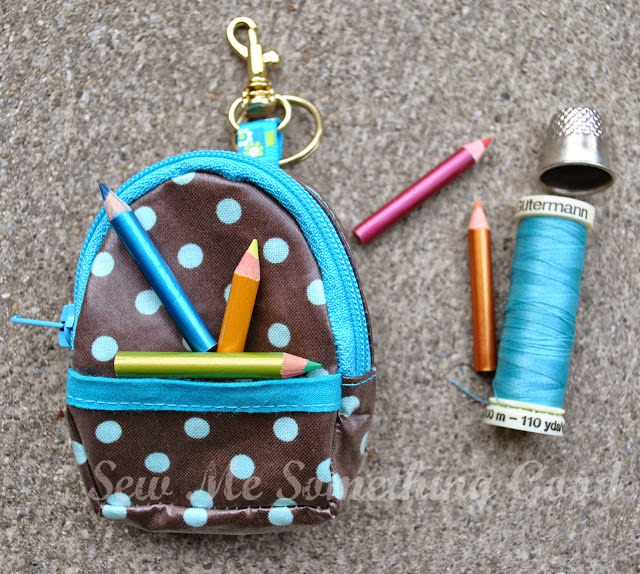 I love that she used scraps from her quilt for the book to make me this mini! It's a mini version of Candy Coated from the designer herself! Talk about a special way to say thanks! Check out the rest of the goodies she tucked into my parcel. Everything a quilter needs... fabric, thread, pins and chocolate! Definitely the best contents a cigar box ever held! Needless to say, I'm thrilled with this very special handmade thank-you. It's now hanging in my sewing room where I can admire it every day. I absolutely love it and can think of no better way to remind me of a lovely friend and the opportunity she gave me to be a (behind the scenes) participant of her book! but maybe you will recognize this. You know you want a copy... click here. Funny story about how my version ended up being in plaid... 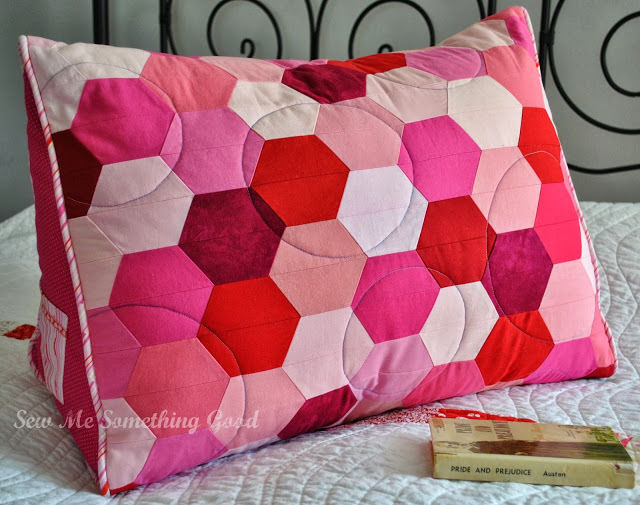 I had just finished sewing a hexagon plaid quilt for my son and after all the matching of lines it required, I was literally tired of plaid. I think I actually whined a bit about it to Amanda Jean. ;o) She patiently listened to my complaints and asked what I had lined up next to work on. I said, "Anything, but plaid!". ha ha... Little did I know what would transpire next and that I would be eating those words. Later, when asked what fabrics I had chosen for making her design, Amanda Jean said she had a good laugh when I wrote PLAID. It was a the perfect choice for Amanda Jean's design! I ended up using more than 40 fabrics in some rows - with no repeats. 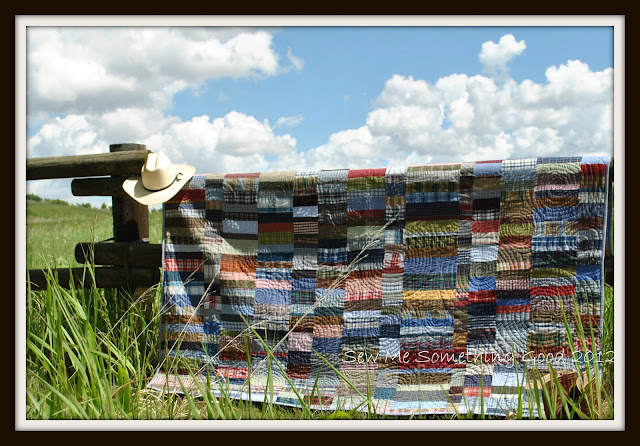 The amount of cutting needed was greatly reduced, there was little waste and that bag of scraps became a one of a kind quilt. Can't beat that! The quilt went together very quickly, thanks to Amanda's clear instructions (okay, it also helped to have all those pre-cut scraps to work with... ;o). 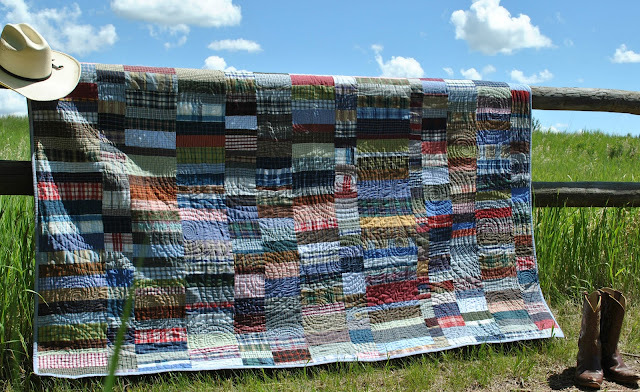 The only change I made was to increase the width of the quilt as my son likes quilts that hang further down the sides of the bed and it allowed me to use up more of those scraps. When it came time to quilt, I knew exactly what I wanted to do - free motion concentric circles. I thought mixing up the sizes of the circles would be even more fun, so I got out my mixing bowls to use as templates and chalked around their outlines. 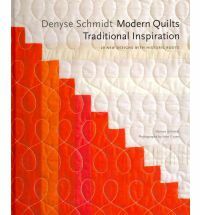 This allowed me to randomly place the different size circles over the quilt top and gave me good guidelines for the quilting. I found it a bit tricky to quilt this design initially, but after some stitch ripping, I soon got it worked out. It was totally worth the initial struggles because I love the texture it added! 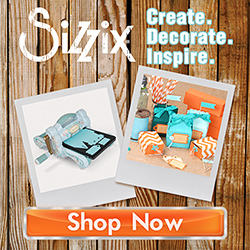 Look at the opportunity to use scraps that this clever design provides! The more you mix up the widths of the strips (or make some wonky for added interest as I did in different rows) the more interesting this design looks. Many thanks to Amanda Jean for her great design! 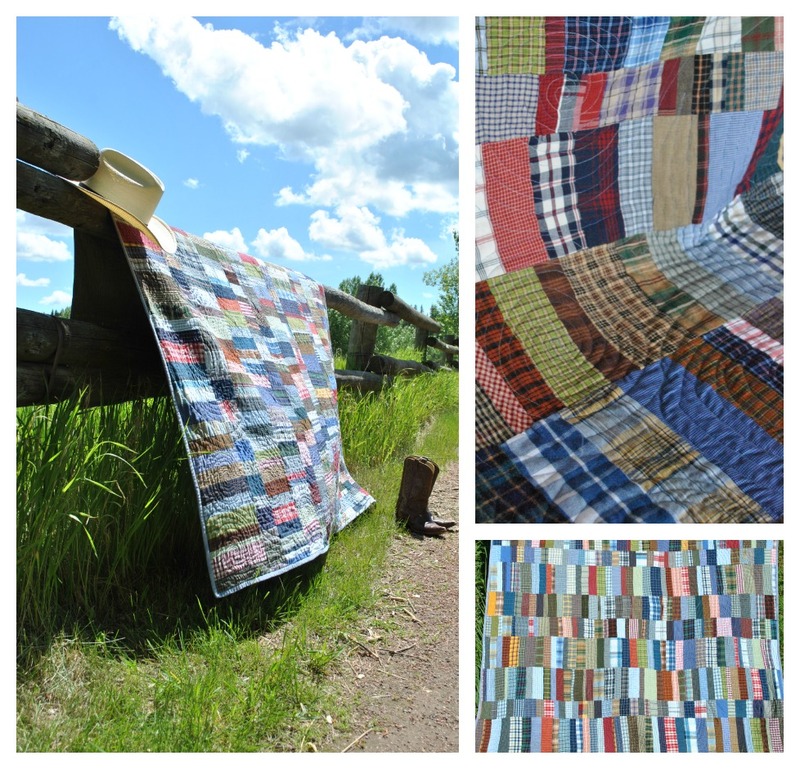 Looking at these photos has me thinking, I'm ready for another scrappy quilt! 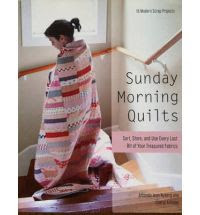 Time to grab a copy of Sunday Morning Quilts. I bet I can make one of her other scrappy designs in anything but plaid. 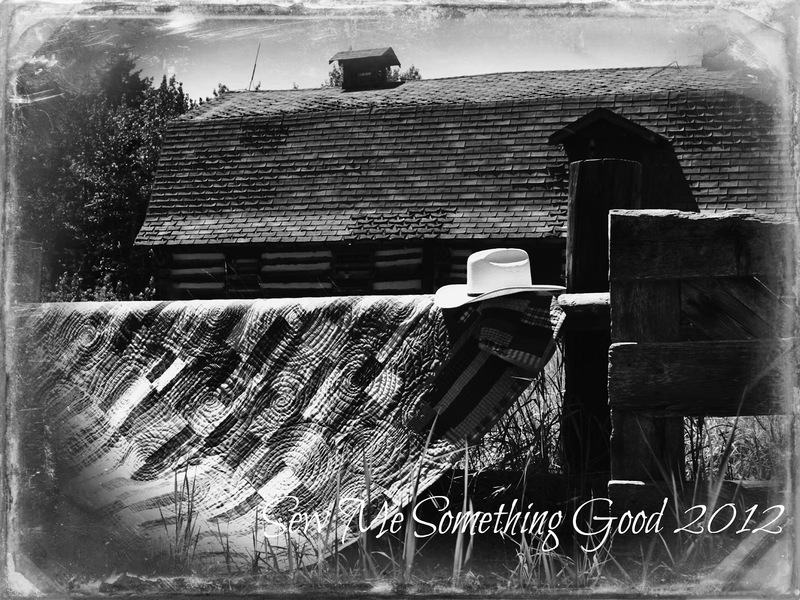 ;o) Yee-Haw! Summer Sewing Contest being held over at Ellison Lane Quilts! 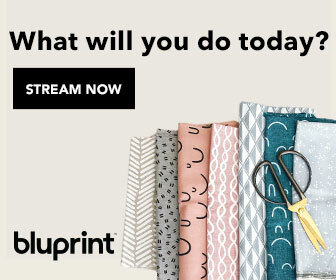 Pop over and check out the fantastic line-up of sewing projects in each of the four categories and be sure to vote for your favourites. 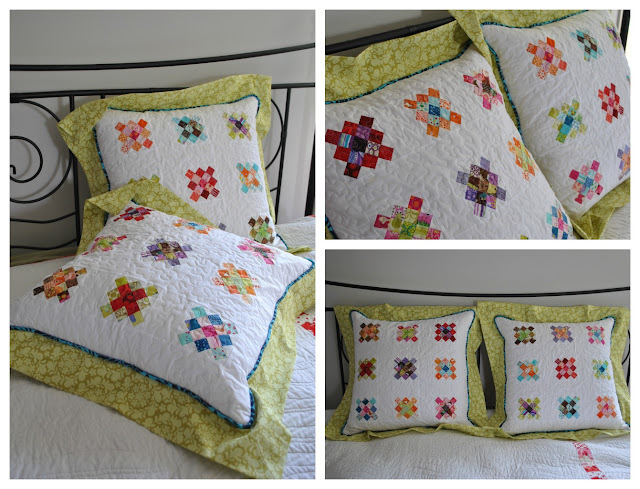 I'm so delighted that my Granny Square pillows are finalists! What a compliment! What next for Sew into Solids? Keeping count, this would make Week #14 for the Sew into Solids group that Jane and I started. 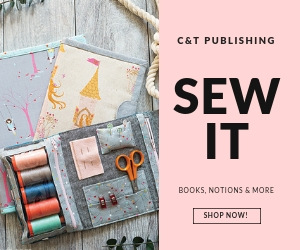 The weeks have flown by and I'm so pleased that we agreed to push ourselves to try sewing something with only solid fabrics and to open up our personal challenge to anyone that wanted to join in. Sewing something with only solids, put me outside of my comfort zone. I gravitate most easily towards combining prints with prints, with the odd dash of solids, but not solids on their own. Since I am also more motivated by scrappy style projects, I wondered if I could accomplish something appealing with only solids. I have great admiration for others that can! Thankfully, I found that there seems to be endless inspiration for solids only sewing projects and even better, there's an ever expanding range of colourful solids to choose from. 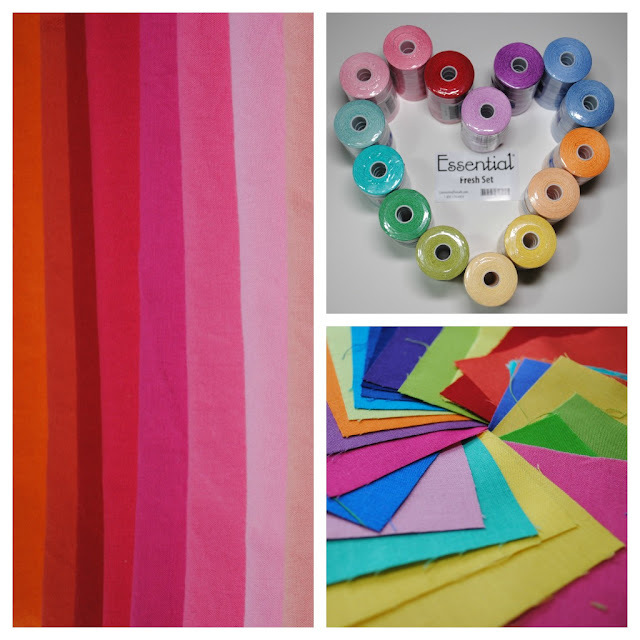 The growing line-up of manufacturers offering solids, makes it possible to find just the colour(s) needed. Little surprise then, that I have begun gathering more solid colour to enrich the choices I have for future projects. 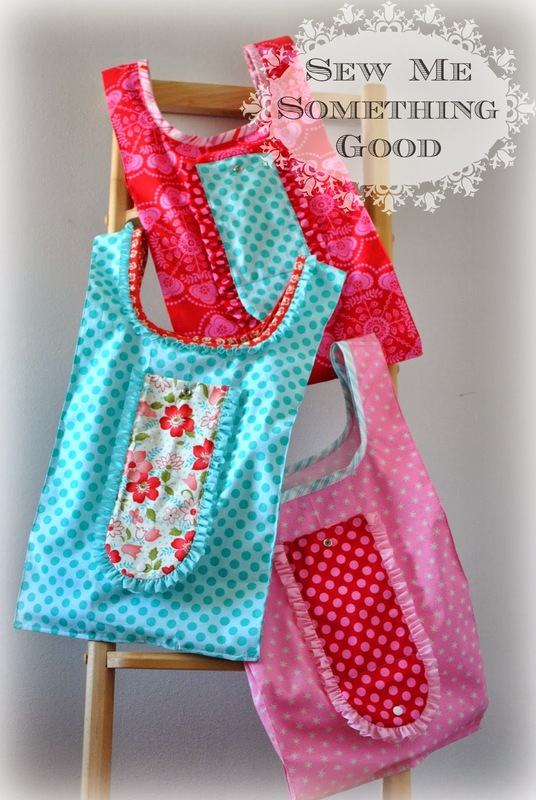 I never knew I would have so much fun sewing with just solids or that the results would please me so much! I'm gathering ideas for my next solids project. Here's a wee sampling of the inspiration from online, that has my attention. I'm undecided on what I will sew next, using only solids, but I'm certainly caught up in the power and possibilities of solids on their own. 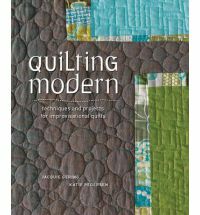 I can finally lay claim to sewing a quilt in nothing but solid fabrics! I used over 30 different values of blue - from dark navy right down to a pale-almost-white blue. The majority of fabric used, being Kona solids, along with a half dozen of Moda's Bella solids, became this twin sized quilt for my son. 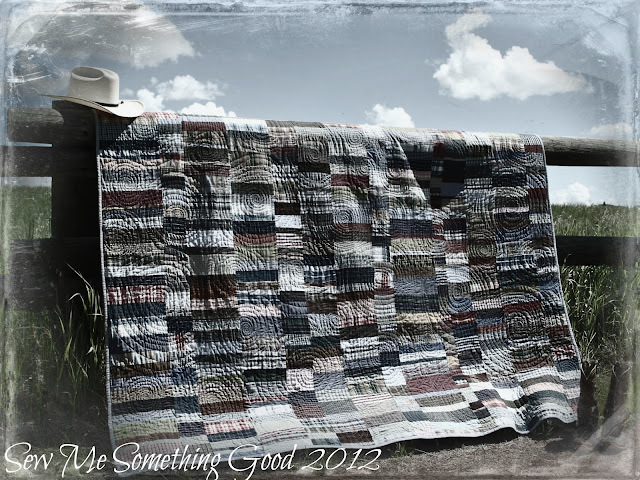 I thought variety of value would be key in making this monochromatic quilt look more dynamic. The pattern I followed used prints - not solids, but I could see the potential for solids to look stunning in this design. 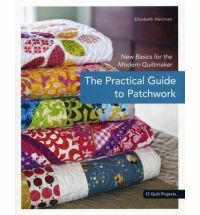 The pattern for my quilt can be found in Evelyn Sloppy's book, 40 Fabulous Quick-Cut Quilts. Natural light best shows the range of value in the blues. The piecing for this quilt looks more complicated than it is. I highly recommend this pattern for the easy methods for construction. I will say that be prepared for taking your time when matching seams and careful pressing, but it's more than worth the effort, in my opinion. I don't think it helped matters that the quilt has been folded up since Monday (waiting for a bit of sunshine for me to take photos of it!). It's interesting to see the texture changes between the border and the blocks - all thanks to the 2 different FMQ patterns I used. I'm amazed at what is possible using a domestic machine! Sewing a scrappy binding proved to be the right finish to the quilt. I kept the value changes random and didn't repeat a single fabric. At times the binding will blend, but it also contrasts, which I quite like. Looking back on this project, I had two concerns. Initially, I was concerned about the possibility that using only solids could make it boring (I can laugh at that now! ;o) and once I got past that, I was concerned that my quilting would ruin things ( but not because I lack confidence with quilting). I realize both these concerns hinged on the idea that solids are unforgiving. That either you "get them right" or they look BAD. Solids don't hide badly matched seams or wonky stitches the way print fabrics can and being somewhat of a perfectionist, this gave me serious pause. Is this quilt perfect? No. Did I have to rip stitches. Yes. Will it win any awards? No. Will it be loved, used and treasured? Yes, yes, yes! So, once I put it all into perspective, my concerns didn't amount to anything. And look! I finished my first quilt in only solids and my soon-to- be-18-years-old-son is thrilled with his new quilt. I see two milestones here. 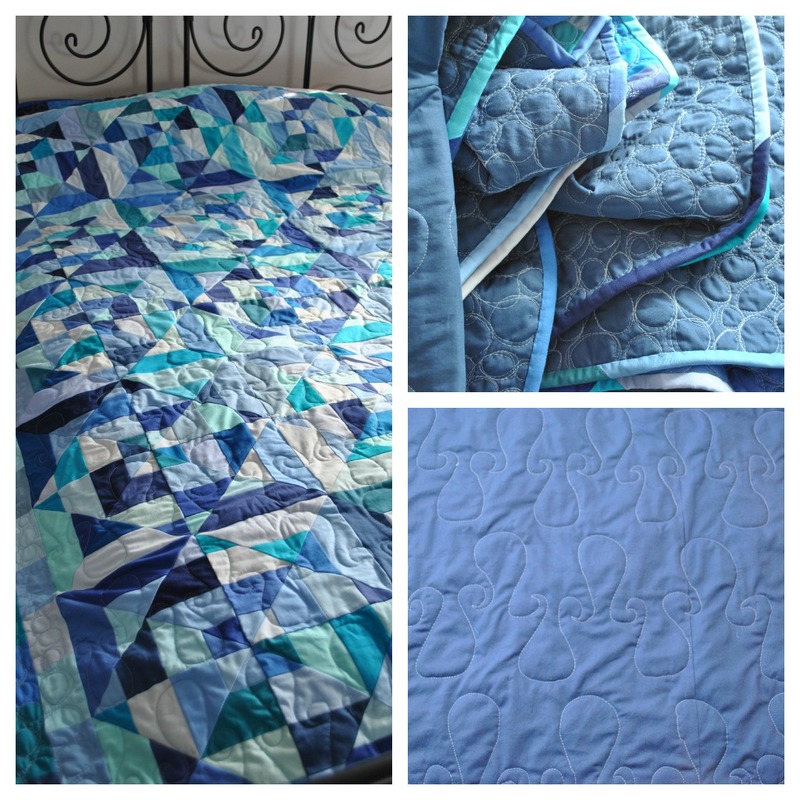 Which is how I came up with the name for it, "Blue Beginnings" - a special quilt to mark my son's start into life as a young adult as well as being (what I believe) only the beginning of my foray into quilting with solids. and making it happen with needle and thread. It's been a little while since I last embroidered anything, but it doesn't take long for me to remember just how relaxing simple stitching can be. Nothing like pretty threads and soft linen to bring joy to a rainy day! Maybe, you'd hope to see photos of the quilt I was finishing yesterday? It's done and I was all excited to show you... but, the weather here isn't the best for photos at the moment. It's dark, overcast and we've had rain through the night, so photos of that quilt will have to wait until we have some sunshine. 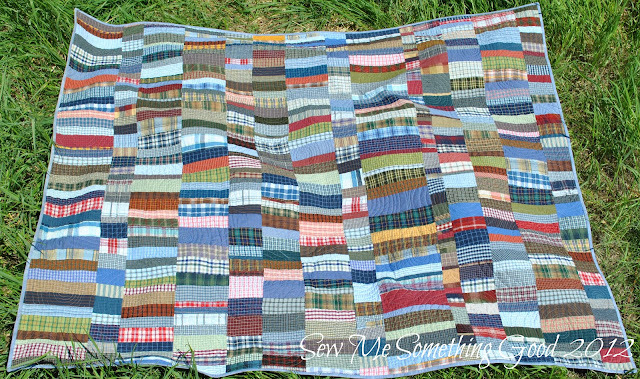 So, instead of a quilt, I have a new vintage find to share with you. Would you like to see what I found just before the weekend? Ta-da! It seems I have brought home a vintage Singer sewing machine. Hidden inside, covered in what appeared to be several decades of dust, was this beautiful (once I cleaned her up...), vintage Singer 201. The serial number dates her as being made in 1947. She's the largest of the four Singers I now own and she was the best deal out of them all. When I saw the ad for her, there was only a picture of the cabinet, which is the exact style of the cabinet my Singer 15-91 came with. No mention of the machine was made in the ad, so I thought I would get the cabinet to have for my portable Singer 99k. Once I contacted the seller, she informed me that the cabinet also came with a 45 year old machine. Okay, I thought, it will likely not be as vintage as I like, but no worries, because I could always pass the machine on and keep the cabinet. Now imagine my delight when we arrived to look at the cabinet, to see this fancy girl. Immediately, I knew she was older than the supposed 45 years and that I had found another gem! Included with her are a box full of her original attachments plus the owner found a vintage Singer buttonholer to go with her. The owner said that she had never sewn with this machine, as it had belonged to her mother. Her mother bought it, barely used the machine and then only kept the machine around to use the cabinet as a side table. Needless to say, other than the dust and grime on Miss Fancy, the machine is in beautiful shape. The cabinet and bench could use some refinishing though. My sons said the first thing I should do is change the bench cover, like I did for Belle. Oh, did I mention that I only paid $25? Yeah, kinda blew me away, too. I'm calling this machine "Fancy". To prove that not all these Singers are exactly alike, here's an overhead shot of the 201 alongside the 99k. Hopefully, you can see the size comparison? The 201 is a bigger machine, with more throat space than the 99k. The 99k was made as a 3/4 size version of a Singer model 66 (a model I don't own, but you never know, with the way I'm going...lol). Both machines are belt driven, unlike my Singer 15-91 (Belle is gear driven). Let me tell you, I'm learning lots about vintage Singers since I started! A different angle of the 201 and 99k. Both have drop in bobbins, unlike my Featherweight and 15-91. Oh, and these two models actually use the same bobbins - which is nice because it's been interesting that I can't swap bobbins with any of the others. Kinda crazy that Singer made several different bobbin styles - it would be handy if the bobbins were interchangeable from model to model. How about a size comparison between my Featherweight 221J and the 201? Doesn't the Featherweight look like a toy? ;o) She's just so little, that it's hard to believe she's a real sewing machine, but she stitches as beautifully as her big sisters (albeit in a very quiet voice). I would never have guessed that a little over a year ago, the purchase of one vintage Singer would lead to me owning four! They've been one lovely surprise after another. The scrappy border was cut from the leftovers of the FQs used for the quilt top, so the colour change occurs every 20" or so. Remember when I lamented, just a week ago, about being unable to decide on how I would quilt it? The quilting is far from perfect, but I'm glad I tried a new design instead of staying with something familiar and comfortable! I find it most helpful to sketch out how I will quilt a design and this time around, I taped the sketch onto my machine to aid me in getting the hang of this new FMQ pattern. I also did a test sample on a muslin quilt sandwhich, to make sure my thread tensions were correct and to help me get familiar with the motion of making these shapes on my machine. Test swatches are pretty routine for me. I consider it as a bit of insurance against having to bring out my seam ripper on my quilt. 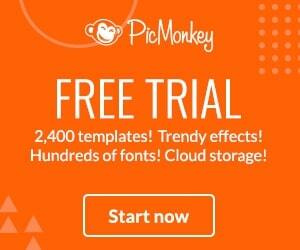 The inspiration image is a free pantograph from the internet (shown in the top right corner of the paper). My sketch is the larger imitation of the original. For the first couple of rows, it was really great to have the sketch to refer to, as I got familiar with the design I found I didn't need to refer to it. This view shows the direction I used to feed the quilt through my machine for quilting - I basically went in a line, forming the loops alternately right and left. I discovered it was easier forming the left hand loops as the bulk of the quilt, albeit rolled up and placed on the right, afftected the ease I had in manoveuring the quilt for the right hand loops. The pattern runs across the width of the quilt - within the pieced borders and I thought it would evoke the sense of movement with all those curves against the straight lines of the quilt block (which I realize you can't determine from a photo from the back. I'm saving front photos of the quilt for the post showing my finish. Sorry to tease you ;o). Oh, this pattern doesn't extend to the outside edges of the quilt because I decided to go for broke and really challenge myself by quilting the borders differently. 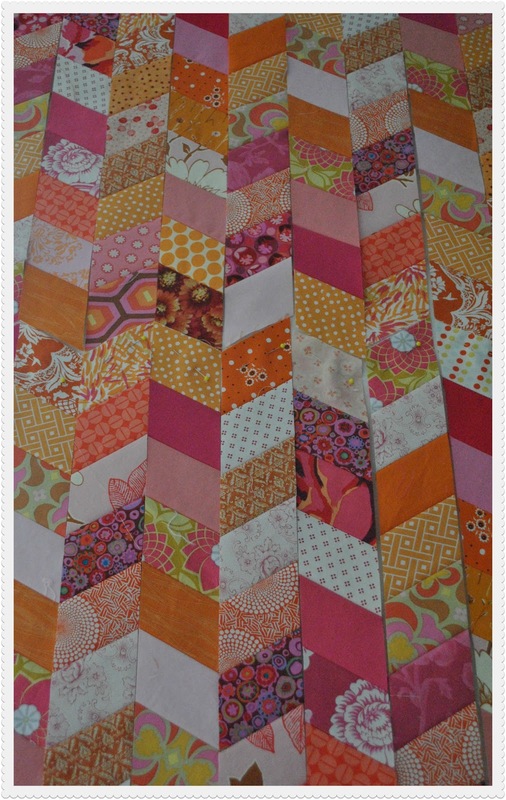 I mentioned above that I quilted the borders of the quilt different from the main blocks. Keeping with a theme of water, I choose to pebble stitch the borders. This is the first time I've tried to do this style of FMQ on something larger than a pillow. Whew. I certainly used a lot of thread! A peek at the pebble quilting on the border, viewed from the back of the quilt before binding. Lots of texture with this! I can't wait to begin handstitching on the binding! The finish is soooooo close now.